Nasa’s New Horizon probe has sent home the most detailed view of Pluto’s terrain you will see for a very long time. The mosaic strip – extending across the hemisphere that faced the New Horizons spacecraft as it flew past Pluto on July 14, 2015 – now includes all of the highest-resolution images taken by the Nasa probe. With a resolution of about 260 ft per pixel, the mosaic gives New Horizons scientists and the public the best opportunity to examine the fine details of the various types of terrain on Pluto, and determine the processes that formed and shaped them. “This new image product is just magnetic. It makes me want to go back on another mission to Pluto and get high-resolution images like these across the entire surface,” said Alan Stern, New Horizonsprincipal investigator from Southwest Research Institute, Boulder, Colorado. The view extends from the “limb” of Pluto at the top of the strip, almost to the “terminator” (or day/night line) in the southeast of the encounter hemisphere. The width of the strip ranges from more than 90 km at its northern end to about 75 km at its southern point. New Horizons spacecraft recently observed a first object in Kuiper Belt – a region of the solar system beyond the orbit of Neptune. “1994 JR1” is a 145-km-wide Kuiper Belt object (KBO) orbiting more than 5 billion km from the Sun. The images shatter New Horizons’ own record for the closest-ever views of this KBO in November 2015 when New Horizons detected “JR1” from 280 million km away. The observations contain several valuable findings. “Combining the November 2015 and April 2016 observations allows us to pinpoint the location of JR1 to within 1,000 km, far better than any small KBO,” said Simon Porter from Southwest Research Institute (SwRI) in Boulder, Colorado. The more accurate orbit also allows the science team to dispel a theory, suggested several years ago, that JR1 is a quasi-satellite of Pluto. The team also determined the object’s rotation period, observing the changes in light reflected from JR1’s surface to determine that it rotates once every 5.4 hours (or a JR1 day). “That’s relatively fast for a KBO. This is all part of the excitement of exploring new places and seeing things never seen before,” added science team member John Spencer from SwRI in a Nasa statement. The observations are great practice for possible close-up looks at about 20 more ancient Kuiper Belt objects that may come in the next few years. New Horizons flew through the Pluto system, making the first close-up observations of Pluto and its family of five moons. The spacecraft is on course for an ultra-close flyby of another Kuiper Belt object, “2014 MU69”, on January 1, 2019. 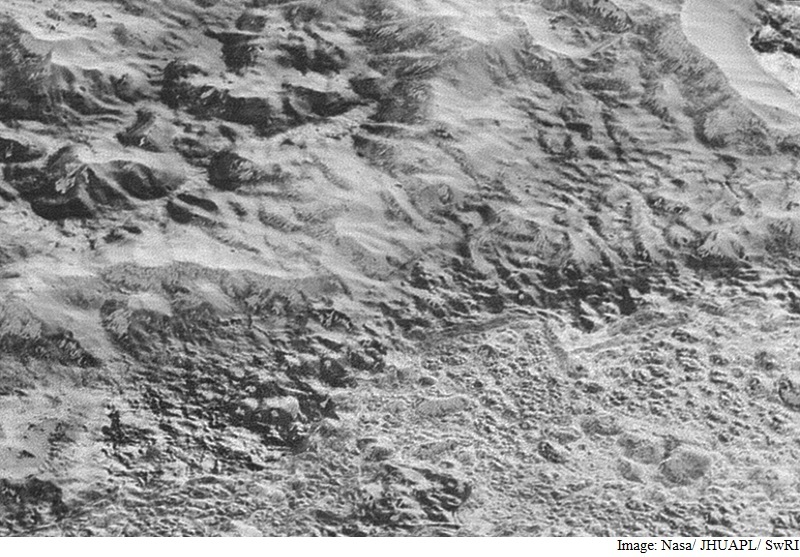 No Comments on "Nasa’s New Horizons Clicks Most Detailed Photo of Pluto’s Surface Yet"